We'd skip the base LX, which features an outdated engine and lacks the safety tech standard otherwise. It's the CR-V EX that offers the best value for the money here. It's hard to imagine a compact crossover better aligned with the needs of most buyers than the 2017 Honda CR-V.
Statistically-speaking, the Honda CR-V is probably at the top of your shopping list if you're in the market for a compact crossover SUV. Its combination of decent driving dynamics and a smartly-packaged interior with more room than its lithe dimensions suggest have made the CR-V a favorite with consumers for two decades running. For 2017, the CR-V is all-new, but its recipe hasn't changed a bit. For the way the average consumer truly uses his or her crossover, the CR-V is about as good as they get. Available in LX, EX, EX-L, and Touring trim levels, the CR-V packs a lot more value and a much-needed dollop of refinement into a new package. It's not all that pretty to look at, but the CR-V casts a more dramatic shadow than before. Its front bumper juts out awkwardly, but LED running lamps on all models bring things solidly into the modern era. From the side, the CR-V's swept-up rearmost roof pillar carries over a design theme introduced in the last model. Even the base CR-V LX includes alloy wheels as standard, too. Things get better inside, where the CR-V's dashboard is functional, organized and, dare we say it, nearly luxurious on range-topping Touring models. So far, we've only had time behind the wheel of that top-of-the-line trim (which should ride and handle just like its less pricey siblings), but we love its firm leather seats and even its matte faux wood trim. The CR-V rides on a wheelbase that stretches about an inch and a half longer than before, which allows for more interior room particularly in the cargo area. Its platform is stiffer than ever, which meant that Honda could soften its suspension a bit to allow for more isolation from the outside world. LX models utilize a largely carried over 2.4-liter inline-4 engine rated at 184 horsepower and 180 pound-feet of torque. 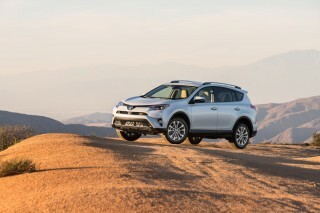 All other trim levels, including the EX, EX-L, and Touring, make use of a more advanced 1.5-liter turbocharged 4-cylinder that checks in with 190 hp and 179 pound-feet, the latter of which is spread across a much wider range of the engine's revolutions. That translates to far quicker acceleration and passing power with from the turbo model than from the standard engine in the LX. All CR-Vs use a CVT and each trim level comes standard with front-wheel drive and offers all-wheel drive as an option. The latter system is now capable of distributing more power to the rear wheels when conditions demand it, like on a dirt road or in a slushy or snowy winter. Though the CR-V won't be confused with a sports car, its steering responds quicker than before and it feels confident, safe, and secure even when pushed hard on a twisty road. The CR-V rides and handles well enough, but its real asset is its interior. Five passengers will find good room and upgraded materials throughout, and cargo is pampered better than ever before. Honda claims nearly a foot of additional cargo space length, yet no degradation in the crossover's front and rear seat room (the latter of which is actually up about 2 inches from last year). At the pull of a lever, the second row's backrests fold completely flat to create cargo area that stretches about 5 feet long and can even swallow a bicycle standing upright with its front tire removed. Honda includes on EX and above models a host of safety tech like automatic emergency braking, adaptive cruise control, lane departure warning, and a system that nudges the CR-V back into its lane if it begins to drift. The automaker groups all that tech under the Honda Sensing banner, and it's a commendable move to make it standard on what the company expects will be about three quarters of all CR-Vs delivered. Only Toyota, which has made most of those features standard for 2017 on the RAV4, goes further. EX trim levels and above feature the company’s 7.0-inch touchscreen infotainment system, which has been updated over previous Hondas thanks to the addition of a volume knob (reason enough to trade in your 2016 CR-V). The interface is simple enough to sort through, but we noticed some lagging as the processor thought through our taps to activate the Garmin-style navigation screen optional on the EX-L and standard on the Touring. The Honda CR-V's exterior is a little quirky, but it gets points for a terrific interior. With its big underbite, the Honda CR-V doesn't make the best impression outside, but its interior quickly reveals itself as a pleasant place to spend some time. All CR-Vs have a relatively bucks-up look, including the base LX thanks to its LED running lamps and standard 17-inch alloy wheels. Opt for the EX and higher grades and you'll be rewarded with classier 18-inch alloy wheels. The range-topping Touring even boasts its own wheel styling and some added touches like chrome detailing and exhaust pipe finishers to stand out further. Yet there's no denying that the CR-V casts an awkward shadow. Its front bumper juts out oddly, almost looking like a safety compliance afterthought. The crossover's side profile, meanwhile, looks a lot like its predecessor at the rear. Honda is attempting to build some brand identity with the sharp, upward angle seen in its rearmost roof pillar. At the tail, the CR-V's lamps are mounted very high, almost like we used to see on Volvos. A wide chrome strip runs between the lamps just below the rear window. Below, the crossover's badges are haphazardly placed and even appear to be crooked from some viewing angles since the tailgate actually bulges outward just above the license plate area. Things are far more conventional inside. The CR-V's dashboard is light on buttons and switches, at least if you opt for EX and above models with their 7.0-inch infotainment screen. Honda has put a new coating on the screen designed to reduce fingerprints, which is nice, but the screen looks like it could take up more real estate on the panel allotted to it. Below, the CR-V's climate control system is simple and intuitive, with heated seat switches on all but the LX. Honda has worked its cubbyhole magic on the CR-V's console, which has a multi-configurable shelf below the armrest. We've only spent time in the CR-V Touring, which has nice leather trim wrapping seats that look almost sporty but provide just enough bolstering. Although the turbo-4 can sound a little wheezy, the CR-V rides and handles wonderfully. Honda has followed several of its rivals into the turbocharging camp with the new 2017 CR-V, and that's all for the better. Under the CR-V’s hood sits a choice of two engines. 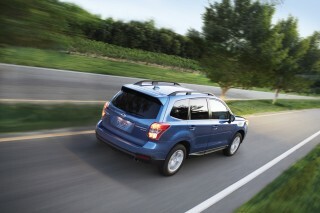 Base LX models carry over last year’s adequate 2.4-liter inline-4, rated at 184 horsepower and 180 pound-feet of torque. Opt for any other trim level—EX, EX-L, or Touring—and there’s a 1.5-liter turbocharged inline-4 rated at 190 hp and 170 lb-ft borrowed from the Civic compact sedan range. That’s not a big improvement on paper, but the torque peaks at a fairly low 2,000 rpm. Honda claims that the turbo motor shaves about 1.5 seconds off of the CR-V’s 0-60 mph sprint. Like the outgoing CR-V, the latest model makes use of a CVT that can send power to the front or all four wheels. More than half of all buyers will likely select all-wheel drive, which Honda says can now send more torque rearward when needed in response to criticism about the responsiveness of the outgoing model’s system. Underneath the CR-V's more sculpted style sits fluid-filled suspension bushings and a floating rear subframe designed to better isolate the outside world. 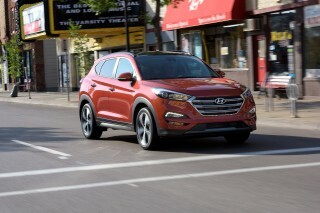 The crossover’s steering has been retuned to significantly reduce the number of turns lock-to-lock (from 3.1 to 2.3), and larger brake discs with an electric booster improve stopping performance. 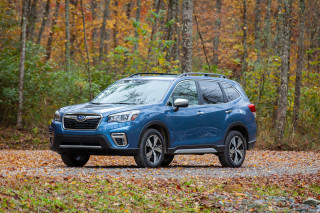 But don’t think of the CR-V as a sporty crossover; that portion of the segment has largely been ceded to the Mazda CX-5 and the Subaru Forester XT. Instead, the CR-V shoots right for the heart of the market. We put a range-topping CR-V Touring all-wheel drive through its paces around Santa Cruz, California, where the roads are delightfully curvy but not exactly paved with precision. The CR-V’s structure is stiffer, which allows for its suspension to be tuned softer without descending into the pitfalls of slop. MacPherson struts up front and a multi-link setup out back aren’t exactly ground-breaking, yet they worked well to filter out road imperfections on some especially pockmarked pavement we encountered. The CR-V rides softly without tossing heads from side to side on a winding road; in our eyes, it strikes a better balance than even the entertaining CX-5. In the twisties, the CR-V’s faster steering responds accurately, but feedback is dull and lifeless. There’s little here to stoke an enthusiast’s passion, but that’s not the CR-V’s mission in life. Instead, it’s commendable for its composure even with the wick turned up a bit. The CVT does a decent job of keeping things in line with the turbocharged CR-V, albeit with some hesitation immediately off the line and an uncouth growl near redline. On the other hand, the CVT does keep the engine within its power band when need, meaning there’s instant grunt on tap for highway passing. So far, Honda hasn’t let us sample the CR-V LX with its carried-over powertrain, but unless you’re on a firm budget, the turbo engine is probably going to be the way to go. It's hard to figure out how Honda pulled this much interior room and comfort out of such a small footprint. Ever the master of squeezing a little extra interior room out of a small package, Honda has made an already comfortable crossover even more accommodating with the 2017 redesign. Moreover, the CR-V feels very comfortable in range-topping Touring trim, with nearly all of its materials feeling higher-buck than its price tag might suggest. On all but the LX model, the CR-V includes a 12-way power driver's seat with power lumbar support that we found comfortable on a longer drive. The second row, meanwhile, has an adjustable backrest and a center armrest. The latest CR-V is a couple of inches wider than its predecessor, which aids interior comfort significantly for three adults. While you're probably not going to fit a trio of linebackers in the CR-V's second row, it is suitable for three average size adults, something we can't say about most of its rivals. In the cargo area, the CR-V features a load floor low enough to accommodate a couple of mountain bikes standing up with their front wheels removed. The floor features a movable panel that can either create a hidden under-floor storage area and a flat load floor with the second row folded or a deeper bay with a larger overall capacity. There's a similarly high degree of functionality in the first row. In addition to excellent small item storage in the CR-V's door panels, a three-position tray in the center console allows for a wide variety of items to be accommodated. Our only real complaint is the size of the center console around the gear lever. It's wide and intrudes into the driver's leg space. What looks like a padded knee pad is, instead, a rock hard piece of plastic. Honda includes big safety tech as standard on almost every CR-V.
Honda has made its comprehensive suite of collision avoidance safety tech standard on all but the base trim level of the CR-V for 2017, something we wholeheartedly applaud. All CR-Vs include the expected front, side, and side curtain airbags, as well as stability and traction control and a backup camera. Models above the base LX—so that's EX, EX-L, and Touring—include as standard the Honda Sensing suite of tech: adaptive cruise control, automatic emergency braking, lane departure warning, lane keeping assist, and road departure mitigation that gently nudges the crossover back into its lane if it begins to drift. Those technologies take advantage of both radar and camera modules integrated into the vehicle's bumper and near its windshield-mounted rearview mirror. Those models also include automatic high beams, blind spot monitors, and the Touring includes rear cross-traffic alert. Unfortunately, all that tech is not available on the LX; we'd like to see Honda Sensing as an option on the LX, although it would probably push its price so close to the EX that most buyers would simply step up to the higher-spec model. The IIHS gives the CR-V top marks—its Top Safety Pick+ score. But that figure only applies to those with Honda Sensing and LED headlights. The LX and EX models with halogen lamps rate only a Top Safety Pick. Meanwhile, federal regulators at the NHTSA have assigned the CR-V five stars overall, including five for all instrumented tests. Only the rollover test prevents the CR-V from earning the highest possible marks. CR-V comes well-equipped in base LX trim, but the EX is the real bargain here. Honda keeps things fairly simple with the CR-V by offering just four trim levels, only one of which offers a single option. Once you've narrowed down your ideal CR-V trim level, the only real decision to make is to pick a favorite color. The entry-level CR-V LX ($24,945) includes a 2.4-liter 4-cylinder engine and a CVT, plus 17-inch alloy wheels, LED running lamps, automatic climate control, cruise control, a 4-speaker audio system, a backup camera, power windows and locks, keyless entry, and Bluetooth streaming audio. From there, the CR-V EX ($27,595) adds a 1.5-liter turbocharged 4-cylinder that's a little more powerful and a little more fuel efficient, as well as 18-inch alloy wheels, heated front seats, automatic headlamps, heated mirrors, a proximity key with push-button start, remote start, a 7.0-inch touchscreen infotainment system, a power moonroof, an additional USB port, and a 12-way power driver's seat. CR-V EX models, and all higher trim levels, also include the automaker's Honda Sensing suite of safety tech as standard—automatic emergency braking, adaptive cruise control, lane departure warning, and lane keep assist, which nudges the crossover back into its lane if it begins to drift. 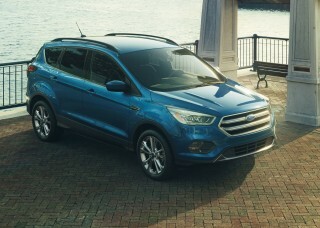 Those who want leather seats can opt up to the EX-L ($30,095), which also includes a power tailgate, a power passenger's seat, memory for the driver's seat, a Homelink garage door opener, an upgraded audio system, and SiriusXM satellite radio. Navigation is a $1,000 option on the EX-L; it's the only stand-alone option on the CR-V aside from some dealer-installed accessories like rubber floor mats and mudflats available on all trim levels. The range-topping Touring ($33,295) adds to the EX-L its own wheel design, a special body kit, side roof rails (crossbars are a dealer-installed item), automatic windshield wipers, LED headlamps, a hands-free power tailgate, and a 330-watt stereo with a subwoofer. 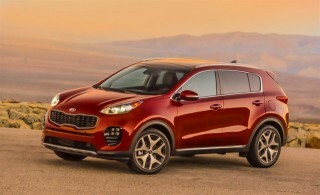 On all models, all-wheel drive adds an additional $1,300. Even the least efficient Honda CR-V is highly competitive. Four flavors of CR-V are on offer, and each has its own fuel economy story to tell. Honda isn't including an automatic start/stop system on the American market CR-V, but its more aerodynamic body cheats the wind well enough to offer improved efficiency on even the LX with its carried-over powertrain. The CR-V LX with front-wheel drive is rated at 26 mpg city, 32 highway, 28 combined. The all-wheel drive LX comes in at 25/31/27 mpg; it's the thirstiest CR-V, but it is still better than most competitors. 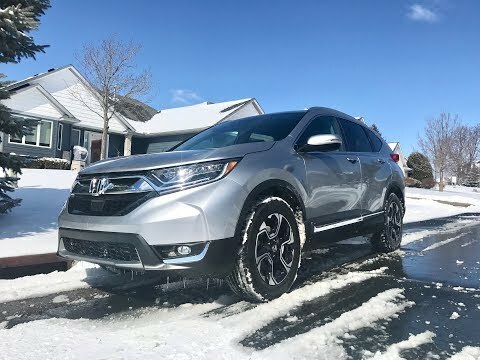 Honda estimates that about 75 percent of CR-Vs will feature its 1.5-liter turbo-4, which means that EX, EX-L, and Touring models with front-wheel drive are rated at 28/34/30 mpg. The all-wheel drive version of those is rated at a still impressive 27/33/29 mpg. Good mileage...and nice except that suspension is not too strong for humps and bumpy road. Love our Honda, pleased with gas mileage after 1000 miles, comfy drive, looks good, only thing missing are storage pockets behind driver and passenger seats. Our first Honda vehicle, owned a Kia Sportage, Pontiac Aztec, Mazda CX5, Hyundai Santa Fe, and feel confident with the Honda CRV AWD, for the simple basic knowledge that they have the best motors and reliable... Our first Honda vehicle, owned a Kia Sportage, Pontiac Aztec, Mazda CX5, Hyundai Santa Fe, and feel confident with the Honda CRV AWD, for the simple basic knowledge that they have the best motors and reliable name in ATV'S, Lawn mowers, outboard motors. 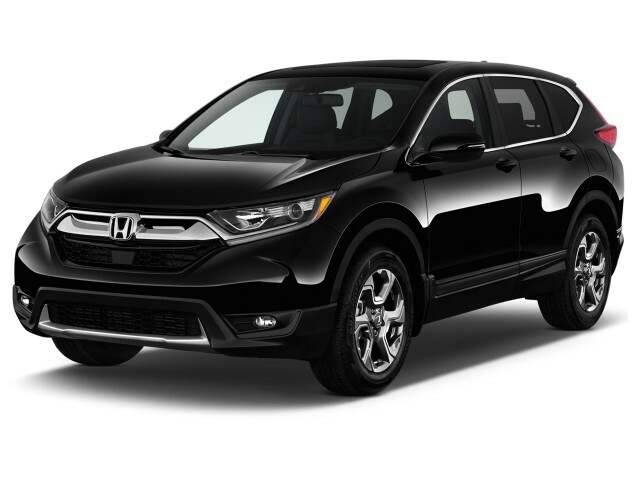 This SUV offers competitive pricing with all features with competitors, and has the best gas mileage ratings, especially like the extra room on the middle console, since the gear shift is a high mount under the display screen, no other SUV has, way to go HONDA! Friendly, co-operative, pleasing deal with Northern Honda. Wish the warranty was longer, may not need it with reliable reputation. Only bummer is the carpet flooring, wish they would use Weather Tech rubber custom fit flooring, not appropriate for cleaning sand, salt from snow, worth paying the extra bucks. Overall, a happy Honda owner, so far. Honda CRV 2017 model is the mother of all Honda family i have ever seen and i greatly give kudos to the company. I love and admire Honda CRV 2017 model. It actually showcase the technological innovation inherent in the composition of the production of CRV 2017. It encompasses all the facilities one can rightly think of a... I love and admire Honda CRV 2017 model. It actually showcase the technological innovation inherent in the composition of the production of CRV 2017. It encompasses all the facilities one can rightly think of a car. It is a car to be respected in terms of comfortability, durability,Fuel economy and safety just to mention but a few. Much roomier, better gas mileage and dependable vehicle. 3rd new purchase in a row (2010, 2014, & 2017). Like the more room and new model trim. Can't go wrong.